The Official 2019 NCBA Division I World Series Logo has been released! The NCBA is excited to announce that Homewood Suites in Cary, NC will once again serve as the official host hotel for the 2019 NCBA DI World Series. Check out all the details of the partnership in the official press release. 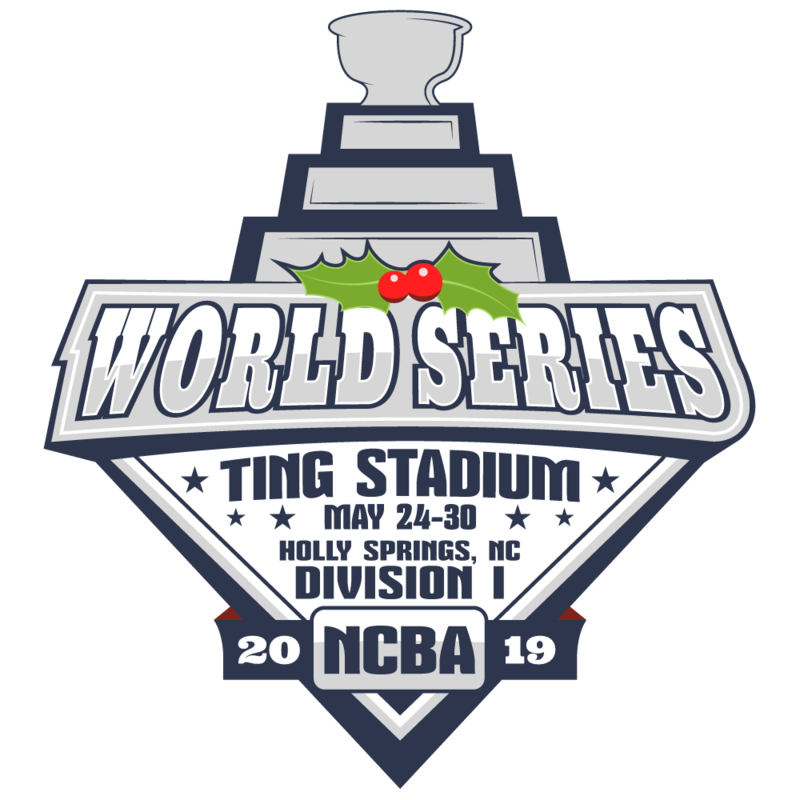 The NCBA is thrilled to announce that they have reached an extension with Holly Springs, NC and Ting Stadium to host the 2019 NCBA Division I World Series. Read the official Press Release announcing the extension here. RAWLINGS NCBA DI FINAL TOP 20! For the first time all year, there is a new team atop the Rawlings NCBA DI Final Top 20! To no ones surprise it is the 2018 NCBA Division I National Champions, the Penn State Nittany Lions! What a great year it has been and what a fantastic DI World Series it was! Just like the previous year, the National Championship was decided with a walk-off performance. If you haven’t heard the call on the online radio broadcast from Ryan Norris, then it’s suggested you take a listen. What a game and what a season! Congratulations to the Nittany Lions and hats off to all the NCBA Teams on a great year! The 2018-2019 season is just around the corner! CHAMP GAME: PENN STATE DEFEATS EAST CAROLINA 8-7! Holy cow! This was a game for the books! In a walk off in the bottom of the 9th, Penn State clinched their National Championship title with a 8-7 victory over defending champions, East Carolina! Patrick Fitzgerald delivered the walk off single and rightfully earned the 2018 NCBA DI World Series MVP honors! Throughout the tournament, Fitzgerald led the Nittany Lions offensively in 4 games going 8-17 (.471) with 2 doubles a HR, 6 RBI’s, 5 runs and 1 stolen base! GAME #13: EAST CAROLINA DEFEATS GRAND CANYON 6-2! After defeating Grand Canyon yesterday to force the “if” game, the Pirates decisively punched their ticket to the National Championship game with a 6-2 victory over the ‘Lopes. Ryan Gosney got his second W of the tournament and earned his second Player of the Game honors with a 9-inning complete game. He allowed only 6 hits, 2 runs (both earned), ONE walk, and sent 7 packing! GAME #12: PENN STATE DEFEATS OREGON 11-0! Penn State officially punches their ticket to the National Championship game with a 11-0 victory over Oregon! Michael Bealmear pitched a complete 9-inning game shut out with only 4 hits allowed, 1 walk, and 6 punch outs. His performance snagged him the Player of the Game honors and the W! GAME #11: EAST CAROLINA DEFEATS GRAND CANYON 3-1! In thrilling fashion, the ECU Pirates defeated the Grand Canyon Lopes 3-1 in 9 hard fought full innings. Logan Walden was a complete BEAST on the mound with 8.2 innings pitched, only 1 run allowed, 1 hit, 6 walks, and TWENTY ONE STRIKE OUTS – earning him the Player of the Game honors!